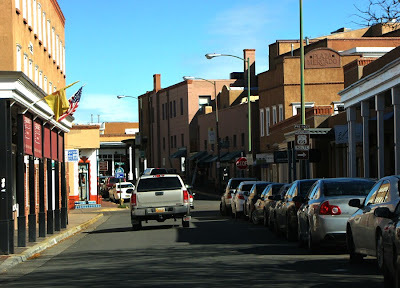 Santa Fe was great and we wish we had more time to enjoy it, but we need to start back home. We will go back a different way than we came. 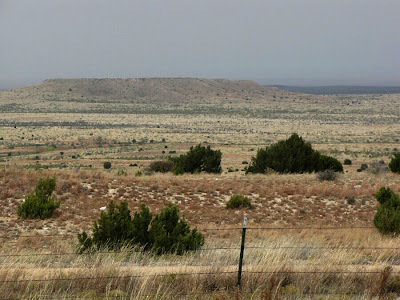 There is some very interesting country to be seen by going out of New Mexico through the northeast and shooting down the long narrow Oklahoma panhandle. As we leave Santa Fe we are struck by how much of the city is adobe. The thick walls of a real adobe house are red clay baked hard in the hot sun. Most of the modern houses are cement but the look is the same. The thick walls insulate from the heat. We go out US 25 towards Springer to connect with US 412 for the drive east through Oklahoma. How would you like to have this view out your back door? 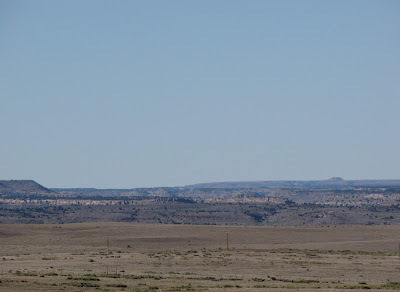 As we approach the northeastern corner of New Mexico we get close to the southeastern corner of Colorado. 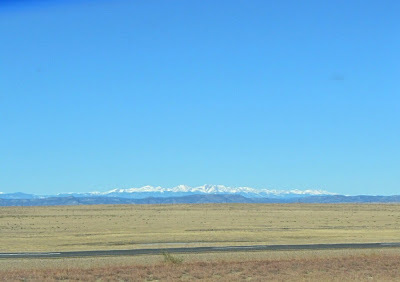 Off in the distance we can see the peaks of the Colorado Rocky Mountains. Oklahoma borders Colorado on the far northeasern end of the panhandle but we will not pass through there. 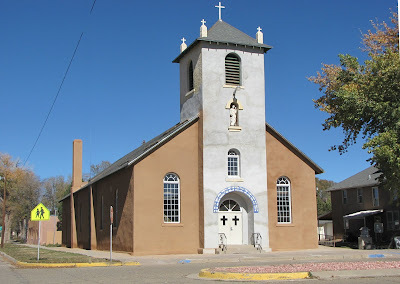 We paused in the little town of Springer, NM to take a picture of this little church. 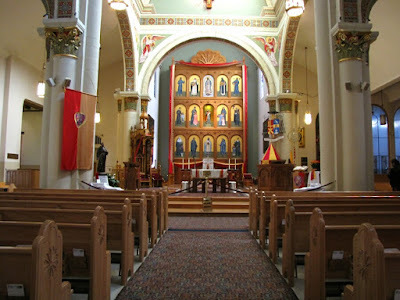 It is St. Joseph's Catholic Church. 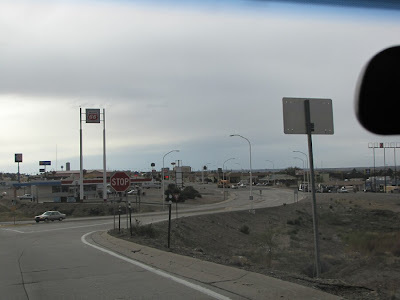 The last town in New Mexico before we entered Oklahoma is Clayton, NM. 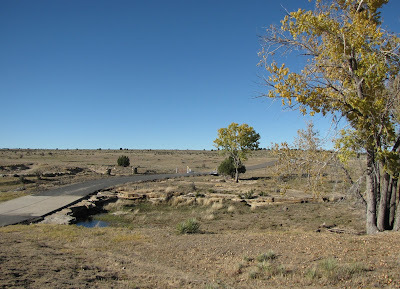 We intended to drive straight to Boise City, Oklahoma but noticed on our road atlas that the hughest point in Oklahoma is Black Mesa at 4,973 feet, and that Black Mesa State Park was only a 20 mile side trip. Oh well, what is another few miles. We may never pass this way again. The view from the mesa was great. We drove to the park headquarters cabin over this little low water crossing. We didn't have time to hike to the high point but enjoyed seeing the camping area. 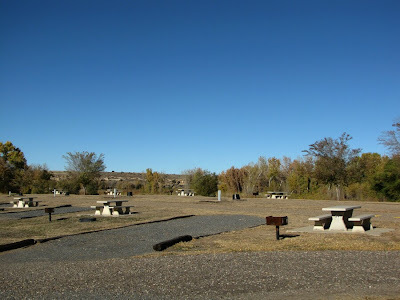 These are individual camp sites for tents or RVs. 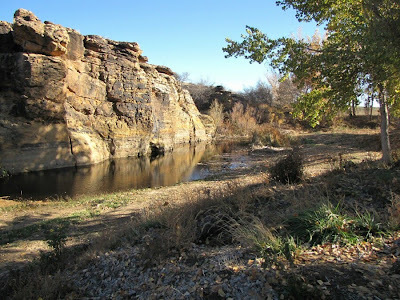 This is the area where the group camp cabins were located. There were maybe 10 little cabins and a larger mess hall kitchen facilities. This would be a great place to bring a youth group. Sue walked Smokey down to a watering hole so he could add a little moisture to the water table. If you would like more information about the park link to HERE. 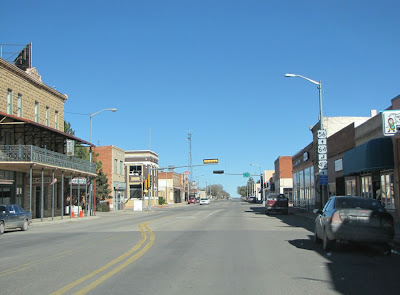 After our detour of Black Mesa we went on to Boise City which is the county seat of Cimarron County. 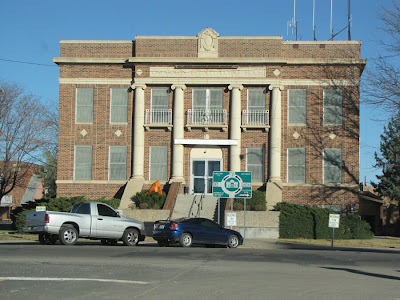 This is the county courthouse which sits on an old fashioned town square. 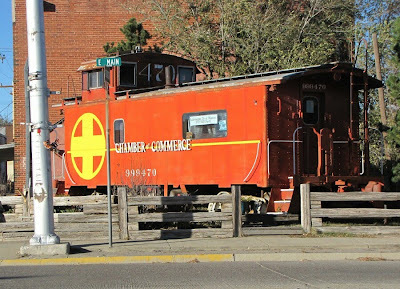 I don't know if the caboose is the location of the Boise City Chamber of Commerce or they just donated it for a display. We did not stop to ask. 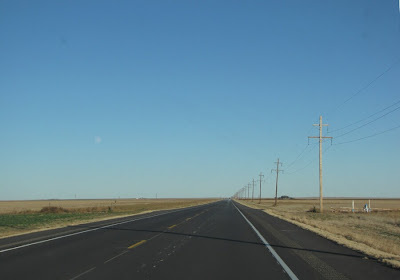 The next 61 miles from Boise City to Guymon, Oklahoma looked just like this - flat as a pancake and straight as an arrow. We are here for the night in Guymon. We have been staying at Comfort Inns where we could. They are our favorite dog-friendly motel. Tomorrow is Tulsa. Oh! When Sue and I went out for dinner this evening we encountered several young boys and girls who were decked out in wonderful costumes. That's right, it Halloween! I almost forgot. Allow me to extend the greeting for the day. BOO! There now, that's better. 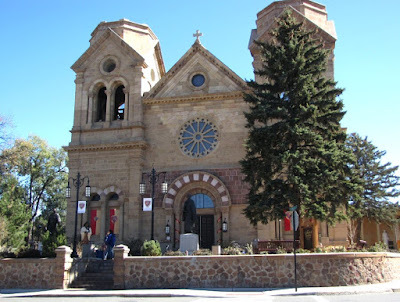 At last we have a full day to explore Santa Fe. After rain and snow we are blessed today with cloudless skies and cold crisp air. 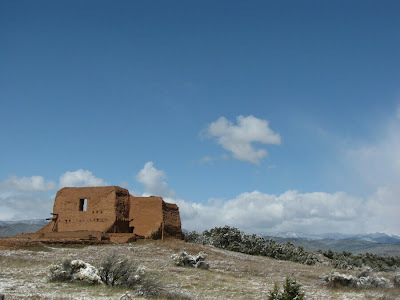 Santa Fe was first occupied by Pueblo Indians in about 1100 and was settled by Spanish colonialists in 1598. Now The population is about 75,000 of which about 45% identify themselves as Hispanic. 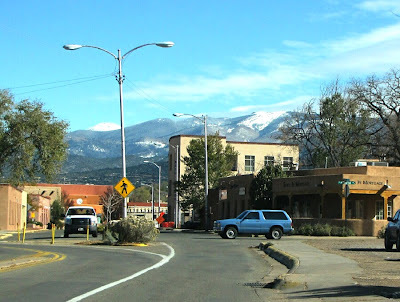 For more about Sante Fe's remarkable history look HERE. 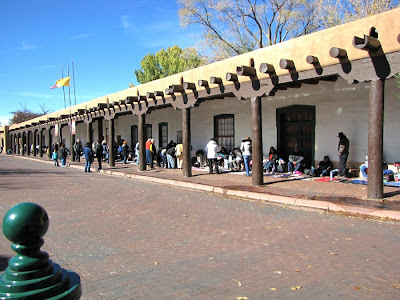 This city is the center of southwestern art and culture, and a tourist mecca. The central downtown is one big shopping area full of art and artists. The preferred style of architecture is adobe. We are here on a cold windy Friday morning in October and the city was full of people. There are so many thing so see here. I took a hundred photos and had trouble whittling them down to 15. This is the Santa Fe Performing Arts Center. 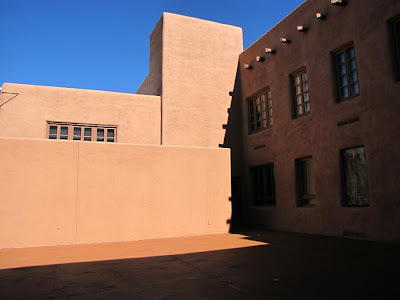 We went through the Santa Fe Museum of Contemporary Native Arts. 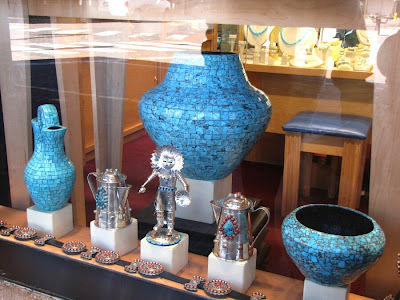 Click for information on Native Art in Sante Fe. 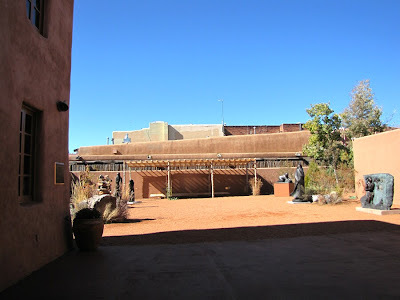 Within the Museum grounds is the Alan Houser Art Park, an enclosed courtyard of contemporary sculpture. For more about this artist see HERE. The contrast of light and shadow against the azure blue sky is very striking. 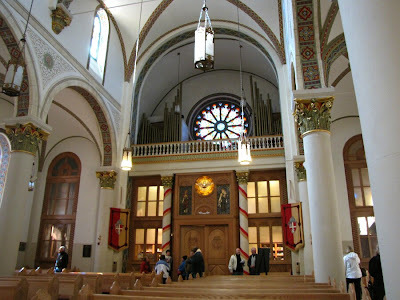 The Cathedral Basilica of Saint Frances of Assisi dates back to 1610. The congregation will celebrate its 400th anniversary next year in 2010. For more information see their website HERE. For an excellent Wikipedia article with a virtual tour of the cathedral see HERE. The interior is light and colorful. Some cathedrals are solomn and austere. Here is a feeling of openness and joy. Clearly this is the home to a living community. Beautiful stained glass and intricately decorated ornamentation stands out against the white surfaces. 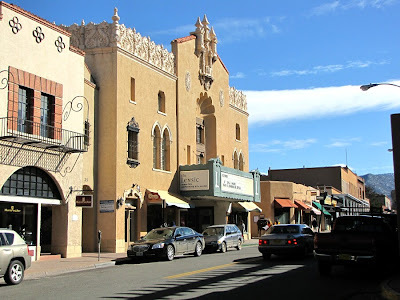 Santa Fe is most of all a center for art and artists. Along the long shelter of the Governor's Palace are artisans selling their work. Paintings, jewlery, sculpture, artifacts of all sorts are laid out on blankets for you to see and hopefully buy. Most of these are not expensive. In the many shops are the unusual and beautiful. These are not for those of us with limited resources. But window shopping is free. This is a wooden bowl, carved on a lath from a single block selected for its grain. 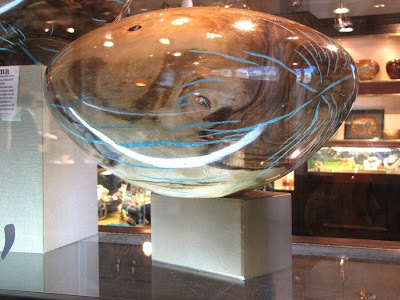 Where there are natural cracks in the wood, crushed turquoise is worked into the cracks and the whole thing is polished to a glassy shine. Very unusual. Many things here are made from turqouise and sterling silver. 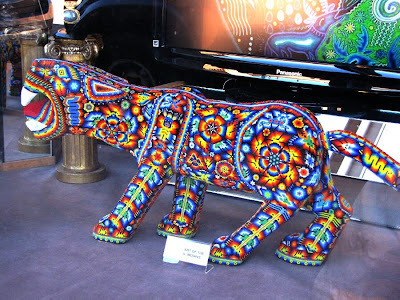 This cat is covered entirely in bead work in stunning patterns. There are so many lovely things offered for sale that I can only offer a brief sample. 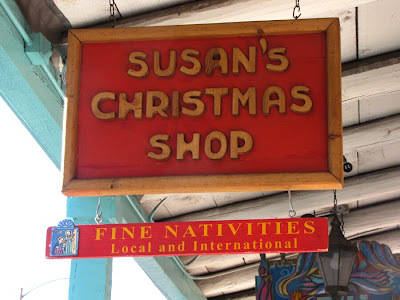 And of course when Susan saw this Christmas shop she had to go inside for a look. We had a wonderful day and a wonderful week. Saturday we will start back home. 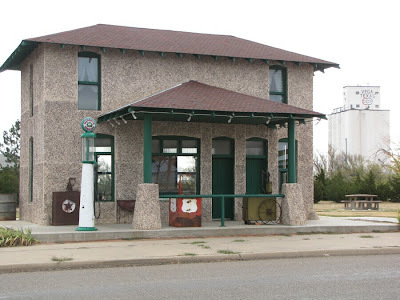 Rather than retrace our circuitous drive down route 66 we will swing back by driving straight down the Oklahoma panhandle. Stay tuned. No sooner had we started out this morning and I discover that my camera's batteries are dead and and so are my spares. So here is one from my iPhone. Not a bad picture from a phone camera. We stopped at a gas station and bought some AA batteries. 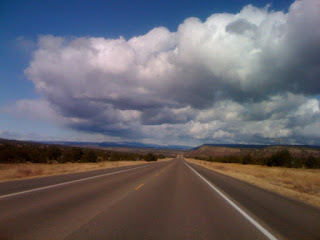 As we drove to Santa Fe we used old route 66 when we could. 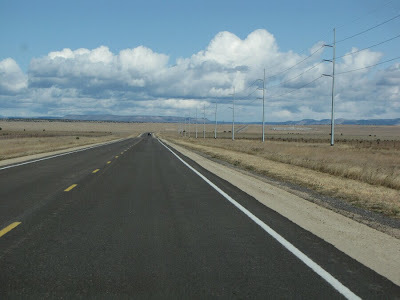 We used Highway 84 which was built on top of 66 for a good bit of the way. When they separated they ran adjacent to each other so it really didn't matter which we were on. This is on 66 and would make a great example of the "vanishing point" in an art class. This is such beautiful country that you can point your camera in most any direction and take a good picture. I took far more photos than I can use here. You will see them sneak in as time goes by. As we drive north the terrain becomes more mountainous. 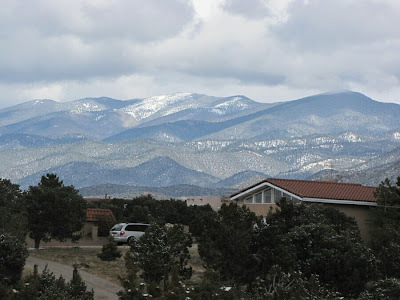 By the time we get to Santa Fe we will be at about 7000 feet (2134 meters). 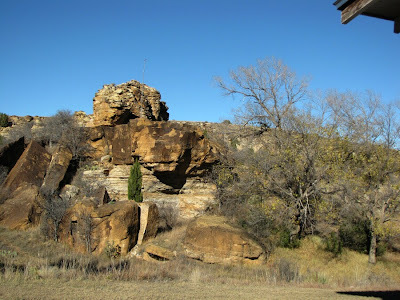 We stopped to visit the Pecos National Historical Park in Pecos, New Mexico. There is a very nice visitors center with tours. 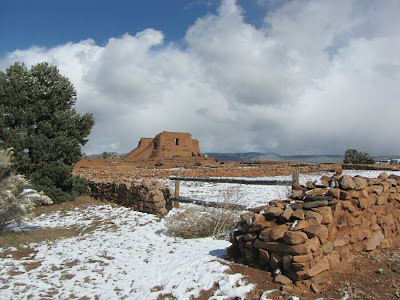 Since the hike was a bit too much for me even with my new chair, we were allowed to drive up to the main attraction which is the ruins of a Pueblo village and Mission. There was a sophisticated society here at one time. The park has a good website if you would like to know more. 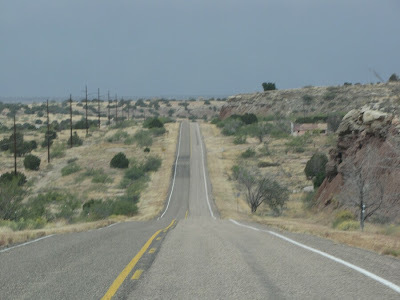 Link to Pecos National Park. This area is also home to a well known Baptist Conference Center. Enormous cumulus clouds kept rolling by. We passed in and out of sunshine then it began to spit rain. We decided that we would not mind living in this house. 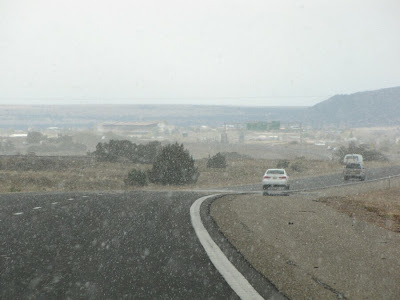 By the time we arrived in Santa Fe it began to snow, a few flurries at first then rather heavy. 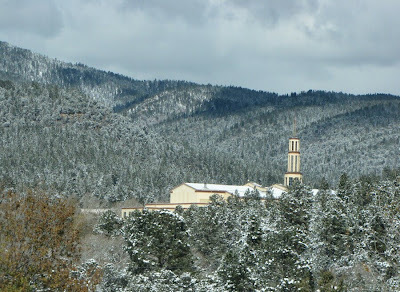 Not the sort of weather we had in mind for looking at the many shops and attractions of Santa Fe. 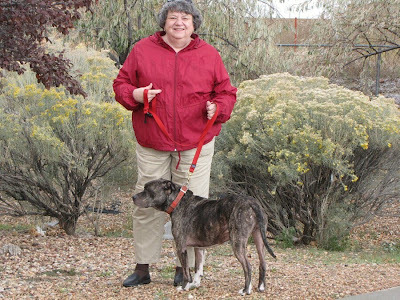 Susan took advantage of a break in the snow to take Smokey for a walk. 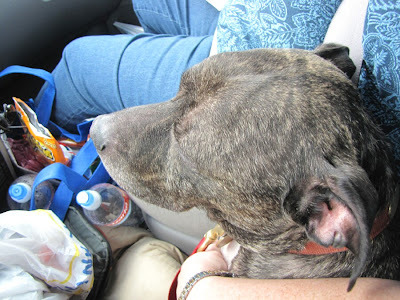 He has been a good traveler. After a break we went to dinner at a Mexican restaurant called Tortilla Flats. This was recommended by the guide book we are using and was excellent. While we were eating it continued to snow. It melted on the streets but covered the grass and autos with a thin layer of white. The forecast is for it to clear off tomorrow and we are hoping that is correct. 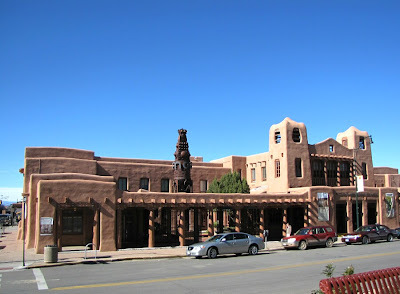 Our plan for tomorrow (weather permitting) is to go down town and go through the many shops and attractions in Santa Fe. When my son David was stationed in Albuquerque with the Air Force I came up here with him and we had a nice time. Susan has never been here before and we are hoping for some decent weather. We are off for another day on route 66. Smokey and Susan keep us on track. As we leave Amarillo we find this establishment on Arnot Road. Going to be out of town for the weekend? 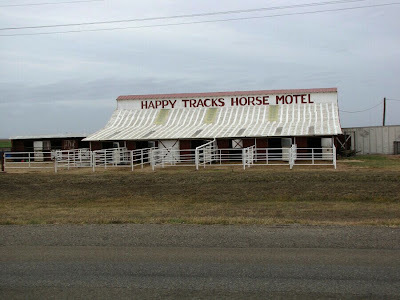 You can leave your horse at the Happy Trails Horse Motel. Between Arnot and Hope Road is the Cadillac Ranch. I will let Wikipedia explain it. Cadillac Ranch is a public art installation and sculpture in Amarillo, Texas. It was created in 1974 by Chip Lord, Hudson Marquez and Doug Michels, who were a part of the art group Ant Farm, and it consists of what were (when originally installed during 1974) either older running used or junk Cadillac automobiles, representing a number of evolutions of the car line (most notably the birth and death of the defining feature of early Cadillacs; the tail from 1949 to 1963, half-buried nose-first in the ground, at an angle corresponding to that of the Great Pyramid of Giza in Egypt. The piece is a statement about the paradoxical simultaneous American fascinations with both a "sense of place" — and roadside attractions, such as The Ranch itself — and the mobility and freedom of the automobile. 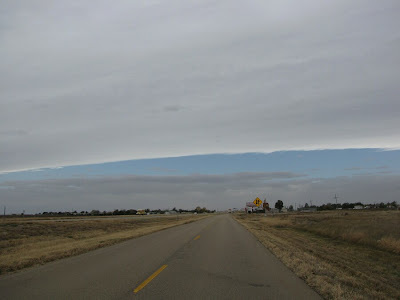 As we drove west across the Texas panhandle we could see a cold front moving in. During the day the temperature dropped almost 20 Degrees. 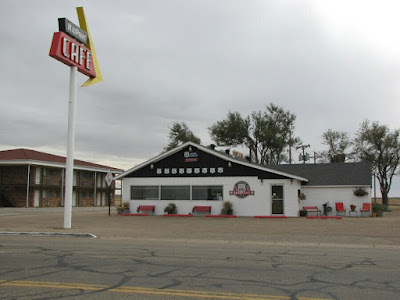 In all the places along old route 66 where local economies depended on travelers patronizing their businesses there are abandoned motels, restaurants, and shops. Some of these towns look quite devastated. However there are still enterprising people who press on. In Vega is a restored Magnolia Station. Note the classic old gravity fed gasoline pump. 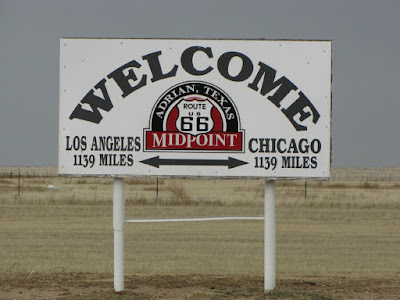 Adrian, Texas is calculated to be the midpoint on route 66. It runs 1,139 miles in either direction. The Midpoint Cafe is reputed to be a good place to eat, however they were closed for the day. 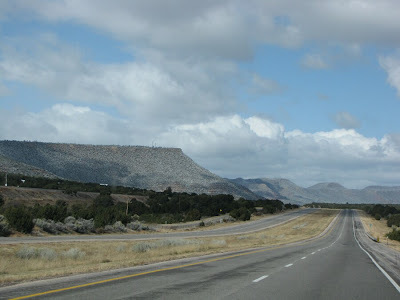 As we drove west into New Mexico the terrain began to change. 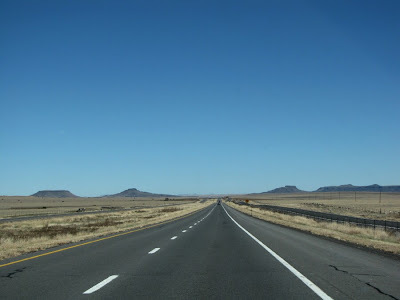 We have left the flat land of the panhandle and are climbing into the high plains of New Mexico. It looks quite different. 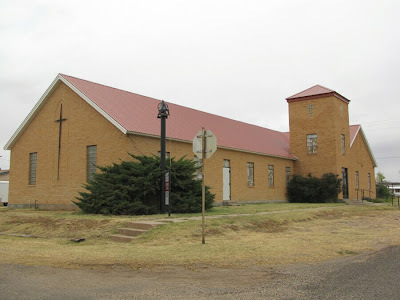 The community of San Jon has been decimated by the relocation of 66, however in the midst of abandoned motels and houses the Methodist Church of San Jon is well kept and occupied. 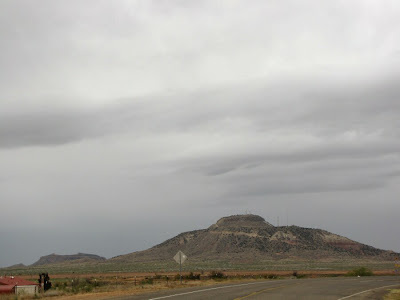 When we get close to Tucumcari, New Mexico we drive through some red rock formations. 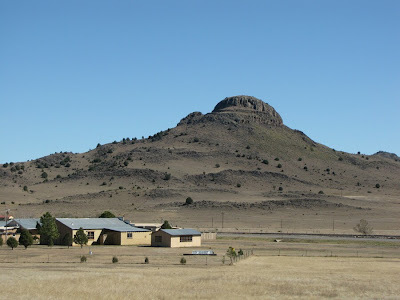 According to our guide book, this is the Tucumcari mountain. 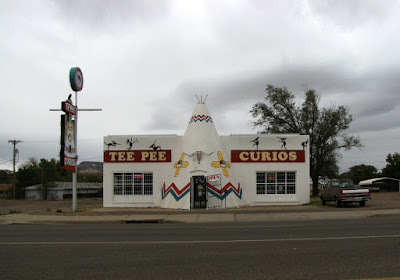 Tucumcari has a population of about 6,000 and has been a favorite stopping place for travelers. At one time it was said to have 2,000 motel rooms. Today many of those are vacant, yet many are still in business. The community host an air show every year to attract visitors. 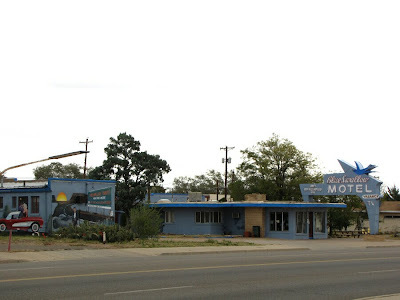 One of the old motels still operating is the Blue Swallow. We understand that its neon sign is very pretty at night. 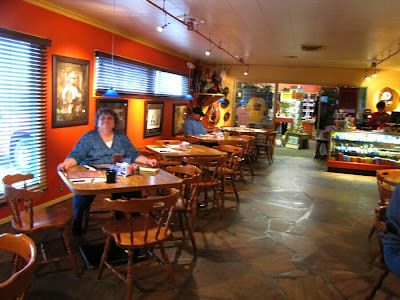 We had lunch at Del's Cafe in Tucumcari and enjoyed a good meal. 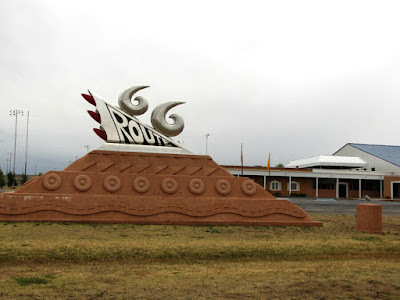 The Route 66 Sculpture stands outside the Tucumcari Convention Center. 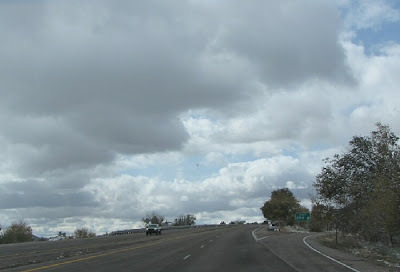 Following route 66 again required that we zigzag back and forth across Interstate 40. 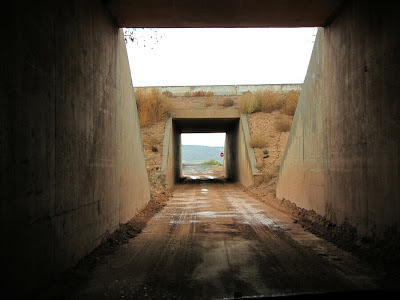 At one point this meant driving under the interstate in a little tunnel. 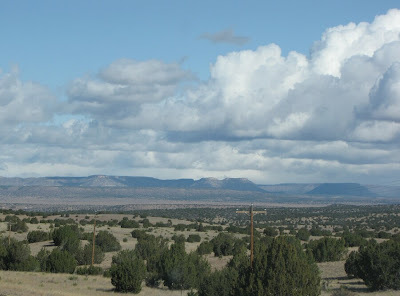 At about 5:30 this afternoon we arrived in Santa Rosa, New Mexico to spend the night. Since New Mexico is on Mountain time rather than Central time we had to turn our clocks back an hour. 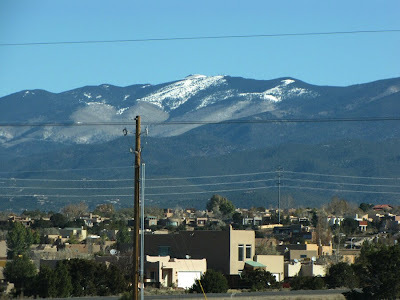 On the news tonight we see that parts of Colorado and New Mexico are experiencing snow. We are not sure how this will affect our plans to drive to Santa Fe tomorrow. Hopefully we can still make it. Stay tuned.